here I came up with this tag. This was way to fun and I will try again. The colors of stains were Tarnished Brass, Broken China and Squeezed Lemonade. Using an embossing folder from Sizzix, (TH Alterations) I embossed the top and bottom of the tag, and rub on more Tarnished Brass Stain. The Young Lady image and It Takes Courage are from Alluring Impressions. 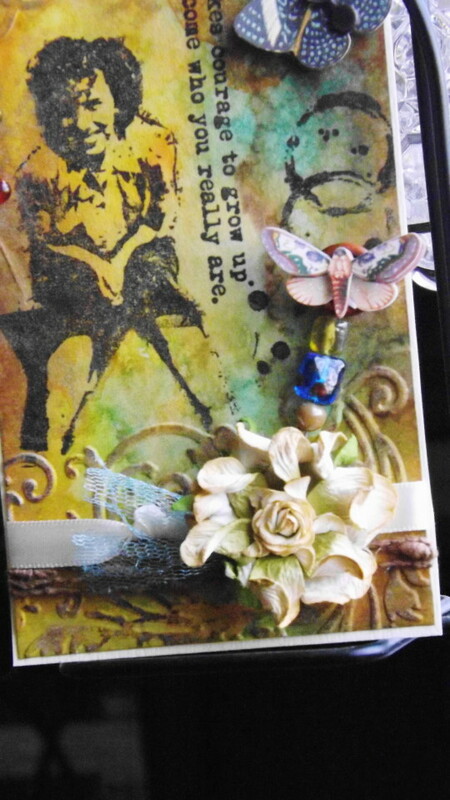 The remaining images are also from Tim Holtz collection. For the rayon seam binding it to was distress with the same inks to match the tag. I used a wooden stick pin (or Hat Pin) and added broken glass beads, which I added a 3D sticker to the top. The top butterfly got some of Tim’s clock hardware and a glass bubble bead. I hope everyone is having a wonderful Mother’s Day, thanks so much for letting me share with you today. Hope you are enjoying Mother's Day and that the boys are spoiling you! 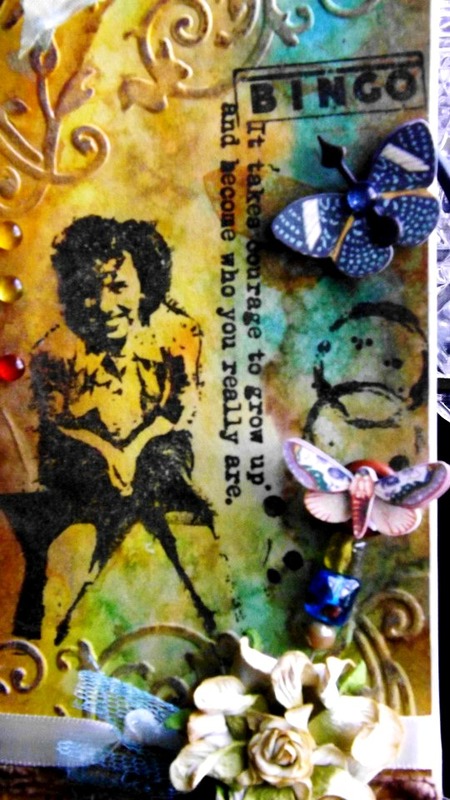 Vada, I am loving these colors and those images with the embossing on the edges! I never would think to add a white layer for a pop of color, but will do that!!! Love this tag! Hugs, GF! Vada, this is just beautiful, love all the colors and the embossing! Hope you had a great Mother's Day.